Rev. 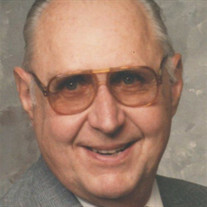 James Allen Herbst, age 96, of Sebring, Ohio, passed away at 7:33 a.m., Friday, October 14, 2016, at Crandall Medical Center. He was born May 7, 1920, in Baltimore, Ohio, to Lee Roy and Blanche (Groves) Herbst and has lived in the Alliance vicinity since 1999. James graduated from Findlay High School, North Central College in Naperville, Illinois, and was ordained in the Evangelical Church (now United Methodist Church) after receiving his Divinity Degree at the former Evangelical Theological Seminary, which is now Garrett Theological Seminary. He was a member of both the Union Avenue United Methodist Church in Alliance and also the East Ohio Conference United Methodist Church. Survivors include his children, Joyce E. (R. Douglas) Hutchens of Wilmington, Ohio, Roger A. Herbst of Akron, and Robert J. (Jane E. Huffman) Herbst of Aurora; grandsons, Kenneth J. (Judie Needels) Hutchens of Cincinnati and Brian D. (Shana L.) Hutchens of Aurora, Colorado; and great-grandchildren, Christopher A. and Elianna M. Hutchens of Cincinnati. He was preceded in death by his parents; stepmother, Trudie E. Ricketts; wife, Lois V. (Blank) Herbst whom he married May 18, 1945 and who died October 15, 2007; great-grandsons, Zachary and Conner Hutchens; and daughter in-law, Kim L. Watkins Herbst. Services will be held at Noon Monday, October 17, 2016, at Union Avenue United Methodist Church with Rev. Dave Andrews officiating. Friends may call one hour prior to the service at the church. Interment with graveside services will be held at 3 p.m. at Ashland County Memorial Park in Ashland, Ohio. In lieu of flowers, memorial contributions may be made to the Copeland Oaks Life Fund 715 S. Johnson Rd. Sebring, OH 44672.